IPM is a sustainable approach to managing pests by combining biological, cultural, physical, and chemical tools in a way that minimizes economic, health, and environmental risks. ---- National Coalition on IPM, January 1994. This section of the Promotion Board Web Site is designed to provide the grower with quick access to much of the information about IPM that we found was relevant to Christmas Trees. The index provides main headings and explanations of the various components of IPM. They are followed by web site links that will take the grower to the appropriate information. This site is treated as a "living site" where people can recommend web sites that are relevant to the index listings so as to help other farmers in the industry. It will also contain a bulletin board that is interactive where farmers can "talk" about the various aspects of IPM. This provides an opportunity to ask questions and share information with others. In addition to minimizing economic, health, and environmental risks IPM techniques can make the industry more user friendly in the eyes of the comsumer. It's important for Christmas tree farmers to be proactive in their approach to farming the land and be willing to share their environmentally sensible practices with the public. Biological Control - Using living organisms to combat against other living organisms, helps save both money, and the environment. By doing something as simple as setting up kestrel boxes, or allowing the fox population to increase, helps to save tree damage by keeping the mice population down. This is one easy idea, for more information, click on one of the sites listed. Calibration - Calibrating equipment not only saves money, but will also lessen environmental impact by helping ensure that the proper amount of material is being applied evenly in target areas. Calibrating is necessary for proper pest control while minimizing cost and environmental impact. Pest Identification - Pest identification consists of identifying and monitoring what insects and/or diseaces are in the field. These two steps can aid you in deciding what, when, and if you need to spray. Another important aspect is knowing what type of damage (if any) insects/diseases can do to your crops. Some insects may actually be beneficial by controling other insects and some diseases may have minimal impact on trees. Pesticide Choice - Pesticide choice goes hand in hand with Pest Identification. Proper pesticide choice means choosing the right chemical, for the right insect, applied at the right time, so as not to waste chemicals, money, and time. If you are unsure which pesticide to use, refer to some of the following web pages, or call your chemical supplier. Physical Control - Physical Controls may not be necessary, but can offer an environmentally friendly way to control vegetation, animals, and insects. Some Physical Controls consist of mowing between rows of trees, cutting infected trees to prevent diseases from spreading, picking cones so that all the nutrients do not go into reproducing. This also includes basal pruning, hand pulling weeds, site prep, as well as building fences to keep out large pests such as deer. Rules and Regulations of Pesticide Use - It's critical to be aware of the rules and regulations pertaining to pesticide application. (i.e., herbicides, pesticides, fungicides, etc.). There can be serious consequences when rules/laws are not followed, including fines as well as personal injury from potentially dangerous chemicals. Rules and regulation information is available from state pesticide control division departments. Safety data including application precautions can be found on the material lable or on its material safety data sheet. (MSDS) More info: UNH Cooperative Extension News - Statewide Pesticide License Training for Private Applicators. Site Choice - Site choice is important because you do not want to waste money or time on a crop that is not going to grow . For example, trees should not be planted where there is standing water a third of the year. The area would be too wet for trees like Fraser to grow. Planting some species on dry sandy sites where they will not do well is another concern and yet another example would be not be planting trees in an area where the road salt runoff is a concern. Species Choice for Site and Climate - A species should be chosen that is going to grow best and be most productive in the planned planting area. The factors involved are geographical, climate and precipitation. 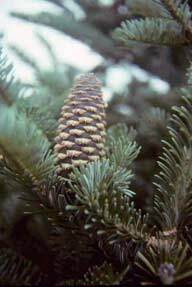 More information: National Christmas Tree Association, Inc.
Plant Identification - Plant Identification consists of identifying what plants are in the field. By distinguishing wanted and unwanted plants, it will aid you in choosing the appropriate chemical to use and the proper timing of application. For more detailed information please click below. This web page was made possible by a grant from the New Hampshire Department of Agriculture, Markets and Food, Division of Pesticide Control. The page itself was researched and written by Ben Hoyt with help from Nigel Manley, Marshall Patmos and Mike Garvan. While the sites refered to have been checked, exclusion of others does not imply that these are the only sites available. Feedback and suggestion for more sites is welcomed and encouraged.